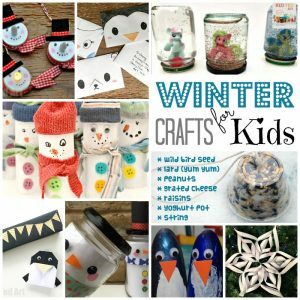 Welcome back to Kids Get Crafty!! 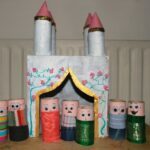 As the Will & Kate Royal Wedding approaches on the 29th April, I decided to host an “impromptu” mini Royal Get Crafty – a collection of Royal/ Wedding/ British craft ideas to keep people busy during and before the Royal Wedding weekend! I called for submissions by 13th April and decided that I couldn’t “just call for submissions” and not do a craft myself.. so after much deliberation, thinking of lovely Red/ Blue & White crafts, looking at Union Jacks and bridal dresses, I came back to a craft I saw over Lilla A a while back.. 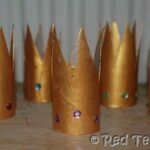 I was waiting for Pip Squeak to “grow up” and demand a princess party before we could make any… and then, I thought, heck no, these are PERFECT for the Royal Wedding. 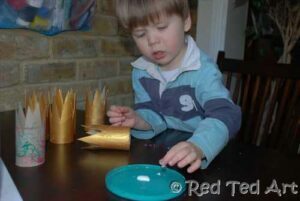 Instead of making party hats make these loo roll crowns for you and your family. They are easy, quick and look FABULOUS! You must check out Lilla A‘s original – as they are wonderfully whimsical! 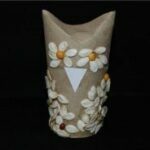 Her blog is beautiful and a true inspiration, please do pay her a visit.. so, to our book & craft today! 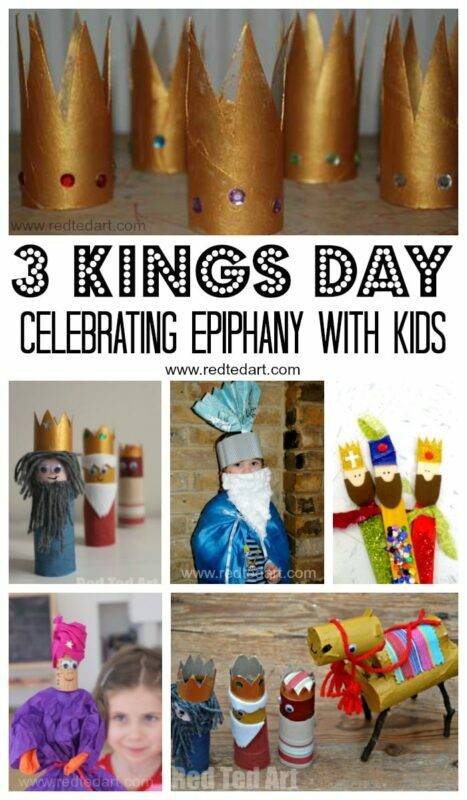 These also make a wonderful Three Kings Day Crafts! 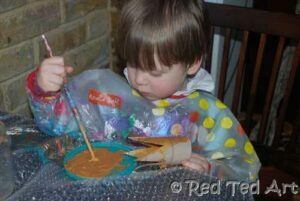 If you are looking for more crafts to inspire you for the Royal Wedding, i ncluding some recipes, check out ROYAL GET CRAFTY! 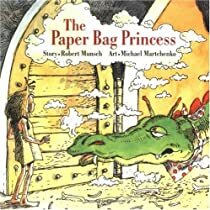 This book was first published in 1980 – which makes the content even more original – it is an upside down story of the classic “prince, princess & dragon tale” – there are many upside down stories” these days, popularised by films like Shrek, but Robert Munsch certainly was one to lead the way this his story. Princess Elizabeth and Prince Ronald are due to be married.. a naughty dragon appears and kidnaps, yes you guessed it, the prince and not the princess. Burning everything down whilst he is at it… so Princess Elizabeth, a tough cookie, shrugs it off, dons a paper bag (her clothese have been burnt) and sets off to rescue her prince. With cunning and wit she beats the dragon only to be met by an ungrateful Prince: the paper bag just won’t do. Incensted by this, the independent princess breaks off the engagement gracefully and leaves. The book is nicely illustrated and it is great way to teach your children about what matters in life: not your pretty clothes, but a strong reliable character. Hooray for feisty and brave Princesses! 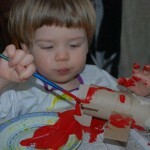 Right.. as mentioned, this craft is “not mine”, but Lilla A! 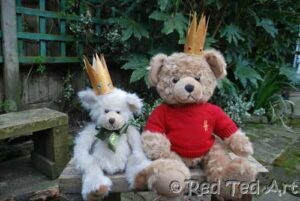 But I adore it and really wanted to have a go… so… I asked Red Ted whether we should make the princess some new crowns, seeing as the dragon burnt all her things. Red Ted jumped at the idea (well, he tends to jump at any idea to make anything.. so this was easy!). 2 Paint in whatever colour you desire. 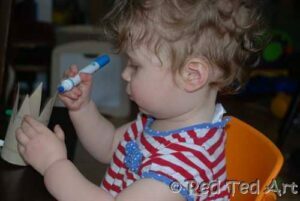 I didn’t have the “nerve” for Pip Squeak to paint today, so she got to colour hers with marker pens. She seemed happy (enough). 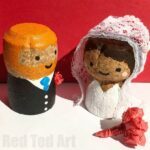 Have you made any “Royal Wedding Crafts”? They could be Royal or just Wedding or “just British”… even some 4th of July crafts may be a good fit! 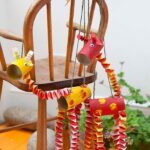 Link them up TODAY, so I can include them in Royal Get Crafty! 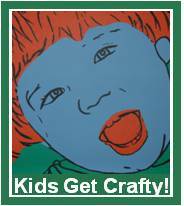 All other Kids Craft of course welcomed too! Gorgeous! You are so ready for the wedding! Good job. Aaaah thank you Lila A!! I am soooo pleased you approve! Love it! I am super excited about the royal wedding. So, I am adoring anything wedding related. Love that you used the gold too! The teddy bear picture is adorable! 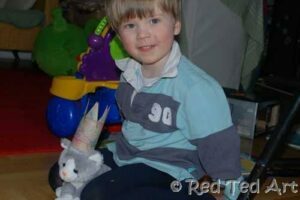 Your children are too cute! It looks like they had fun! Thanks for hosting the link up. Now off to take a look! Thanks Kerri! The crowns look really cute on the kids too – but they just “wouldn’t” let me photograph them… Pip Squeak loves hers!! Very nice! I’m super excited about the royal wedding, too! 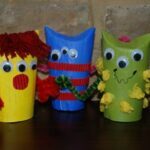 We love the Paper Bag Princess – I too really do like the morale of the story! Those crowns are simply adorable! I can see having a princess party for all our dolls in the near future! Love the crowns – how adorable!! Yes – hooray for feisty and brave princesses! Thanks for your notes. Your posts have really inspired me to do more art projects with my son. He’s starting to blossom as a result. Oh Julia! That is a lovely thing to write! Thank you so much, I appreciate it!!! May both our sons continue to blossom!!!! 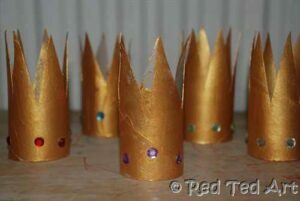 These are the cutest crowns ever! They remind me of a wonderful black and white photo of my three older brothers sitting with their teddies at a birthday party, all of them wearing mini party hats that my mum had lovingly made (teds too!) 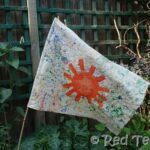 Ah, a little bit of nostalgia 🙂 Thanks so much for linking to our It’s Playtime link-up…I feel honoured! Sorry, no royal crafts here, just eggs, bunnies and chicks:-). But…I LOVE your crowns! You know, we have never read that book. I always think about it, but never remember to check it out from our library, so thank you for another reminder. 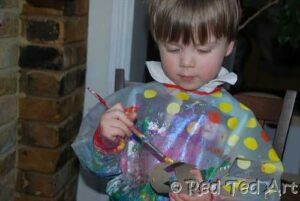 These are some sweet pictures of your little ones creating too. Oh yes- your stuffed animals are SO ready for the Royal Wedding! I love that you are doing Royal Wedding crafts. I wish I would have gotten to this sooner, but I did link up with our princess unit we did awhile back. I had been thinking about what we could do to celebrate so I decided we’ll do our Great Britain studies next week. And we’re planning our fancy outfits to wear on the wedding day and what British food we’re going to eat. I love the little doll sized crowns. 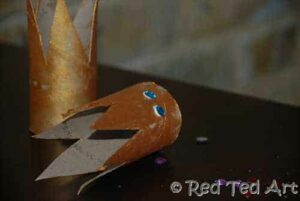 Jenny – fab princess post, will add it to Royal Get Crafty, which is out later today! This book is a favorite. The crowns are so wonderful. Thanks for linking up. Another of our favourite books! 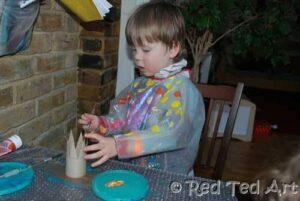 I LOVE this craft so simple and using our old favourite, the loo roll! 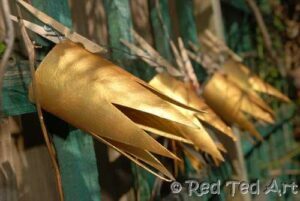 I just bought some gold paint in the sale so would be rude not to use it don’t you think?! Great, great, great Maggy! Thank you so much for kicking off the Royal Wedding on the RC! Look how many links you got! Fabulous folk out there! This was a favorite in our family. I love the alternate fairy tales. The Ordinary Princess is a chapter book that has become popular among various relatives for its alternate take on the traditional tales. The ability to explore art and literature are one of the many things I love about the freedom of homeschooling. There is time to focus on creativity in learning. Thanks for linking up to Creative Juice Thursday! Hope to see you back this week! Sounds like an adorable book! Love the lesson! Thanks for linking up at Feed Me Books Friday! I love these! Can I just say I love how you use a book for inspiration – just brilliant.